The financial crisis had some direct effects on the Moscow wine market. Initially, imported wines became a relative bargain – rouble prices did not change as the currency depreciated, so a 450 rouble bottle that was almost $20 before became $13.50. As the year wore on, importers adjusted prices upward to accommodate increased import costs as the older stock cleared. 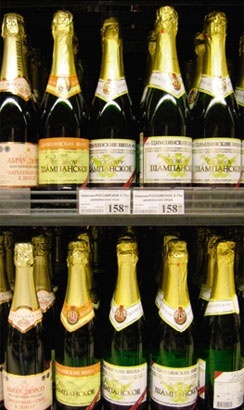 Supermarkets such as Sedmoi Kontinent appeared to adjust buying strategies to peg rouble prices at pre-crisis levels to keep the majority of bottles in the 250- 500 rouble range. This meant that lower quality imports replaced some better wines on the shelves. Most boutiques just increased their prices since their customers are not particularly price sensitive. 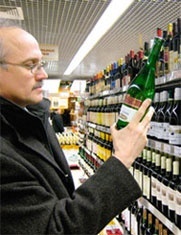 Azbuka Vkusa remains the best supermarket for selection of wines at various price levels from value priced to expensive. They stock an extensive line of very good wines and some you won’t find anywhere else. Sedmoi Kontinent now runs a distant second. Globus Gourmet gets a prize for excessive prices, quite an achievement in this market – go to a boutique for these wines and save, a lot. If you can get a membership card, their prices Metro certainly has the best prices in town and the selection is more than adequate. The only catch is the requirement of a membership card to shop at Metro. The boutiques are generally owned by importers so they usually have the best prices for a particular wine, though the stock is mostly expensive to very expensive. Kauffman gets the nod for best boutique for stocking a very good line of wines priced under 600 roubles. In addition, Kauffman has been deeply discounting some of its stock, notably Australian wines. It looks like the other three principal boutiques, Magnum and Decanter shops owned by importer DP Trade, Grand Cru owned by importer Simple Wines, and Kollektsiya Vin, have given up on wines under 1000 roubles. There has been some reportable progress in the Russian wine industry in 2009, and domestic producers have been winners from the financial crisis. Though the French built and run Chateau Le Grand Vostock is still the leader, Fanagoria and Myskhako wineries, with the help of Australian flying winemaker John Worontschak have some competitive offerings. 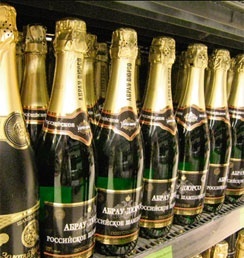 Also, the Fanagoria and Myskhako wines have better availability in Moscow – Myskhako opened a shop on Old Arbat across from Hard Rock Café and Fanagoria wines are regularly available at Sedmoi Kontinent and other retailers. Early in the year Passport tasted samples from the five firstgrowth Bordeaux chateaux. At over $600 per bottle from one of the wine boutiques, we learned a lesson in Russian wine retailing – these wines, which should have been some of the world’s best, were, well, disappointing would be an understatement. Wine shoppers take heed; fine wines require excellent transport and storage, which appeared sorely lacking in this case. Novy Svet Pinot Noir Brut (577 roubles), a very dry rose sparkling wine made by classically, a wine that bested some French Champagnes in a Passport blind tasting in 2008. Abrau Durso Classic Brut (616 roubles), a classic Champagne style wine from this historic winery on the Black Sea. Samogan (moonshine) from Stavropol region’s Praskovaya Winery (available at the Stavropol Wine and Cognac shop on Maly Gruzinskaya). I’m often asked what to get for party and banquets this time of year. Chateau Le Grand Vostok is my usual answer – the prices are reasonable and many people appreciate to know that a good wine can be made in Russia, expats and Russians alike. Novinsky Passage, Novinsky Bulvar 31.